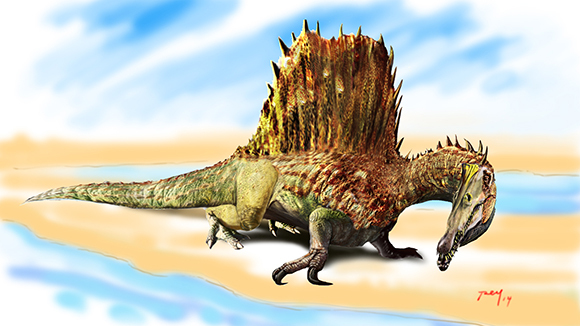 The continuing Spinosaurus saga has reached its peak with Paul Sereno and National Geographic’s final, detailed description of the new version of Spinosaurus aegyptiacus. And things just couldn’t get weirder. Are we witnessing the first ever “cetacean-like” dinosaur? It has the bone density of a hippopotamus, but neither the shape of the body or the limbs. It was an aquatic animal that supposedly could walk on land… but how? Seeing the mind-boggling limb proportions, I’m not convinced of all the lavish reconstructions I’m seeing around, and specially those illustrations that pretend to have it easily walking on land… the hind limbs are extremely small and , by themselves, I don’t see how they could have withstand the incredibly long horizontal body and tail on solid ground… On top of that, those forelimbs are not for quadrupedal walking (neither knuckle walking as it has been suggested)… So how did it managed to walk on land? I have a true obsession to try and make any reconstructions as anatomically believable as possible… and have come with this work in progress I’m presenting now: a combination of ancient whale-like animal and a seal… Don’t forget the dimensions (15 meters long)…could it be we are seeing the first dinosaur that actually was in the process of evolving into a “whale dinosaur”? For me this only stresses the fact that Dinosauria is a “Class” just like mammals are! The common root and immense diversity of these animals can’t be denied! Here’s the original sketch as I started working on. l’m using all the available material, so, as Thom Holtz and Scott Hartman have wisely stated, unless something is wrong with the limb proportion (the arms are after all a composite)… well what you see is what you get and we have to abide by the current evidence… This may change of course, but in the meantime, I don’t regret the destruction of yet another Spielbergian-oriented fantasy… and with a monster even more incredible than any fantasy! This entry was posted in African Prehistory, Spinosaurs, Theropods, Uncategorized and tagged National Geographic, Paul Sereno, Scott Hartman, Skeletal Drawing, Spinosaurus aegyptiacus. Bookmark the permalink. Ciertamente me atrevo a decir que esta reconstrucción no es muy convincente para mí……. pero como tú lo mensionas Luis, este spinosaurus es un dinosaurios ensamblados en base a otros espécimenes del del clado spinosauria y de los primeros fósiles, de los cuales solos quedan láminas, habría que indagra si no es que se tartá de mas de un ejemplar y en este montaje no hay han mezcla de varios animales (jóvenes con adultos). Además, algo volveria más extraordinario a este dinosaurio seria corroborar la presencia de plumas filamentosas o algo mas avanzado, ya que mi imagen personal de este dinosaurios iempre ha sidos como una especie de pelícano combinado con un cocodrilo y un cormorán (por no decir pingüino), saludos! Spinosaurus has indeed turned out to be stranger than fiction. Looks like even recent reconstructions have been wrong. I agree with you, if these new findings turn out to be correct, than this could indeed be the first “cetacean like-dinosaur”. I’m very anxious to read the scientific paper that just came out. Some things I do have a question about are, how complete are the back legs? Are they from a subadult or juvenile? Secondly, how complete is the tail? From looking over the descriptions of other Spinosaurids (Suchomimus, Baryonyx etc.) It looks their back legs are longer, plus the other two mentioned come from more complete specimens. Is Spinosaurus an exception to the rule as far spinosaurid morphology goes? It sounds like this new Spinosaurus find is a composite of different specimens. Correct me, if I’m wrong, but does that bring more questions up about this particular theropod. How does bone density in other Spinosaurs compare to Spinosaurus? I find it hard to believe he could have bone structure signifigantly different than closely related cousins. I want to read that paper too. Maybe Spinosaurus had a keel on its belly, allowing it to push itself along on land, like a giant crocodile-penguin monstrosity. NOT! Interesting drawing, Luis! Kinda thinking that Spinosaurus’ back legs would be very strong to support its entire bulk, and if its feet were webbed and its toes could spread out, its feet can become pretty strong bases to stand and balance on. And its long tail would add as a counter balance to prevent it from tipping forward too much. And if it does tip forward while walking, Spinosaurus can use its knuckles and rather long arms to push itself back up quickly. When I first saw those hind limbs and pelvic bones, I thought to myself “That just CAN’T be right!” Every other spinosaurid has body proportions similar to other theropods. My only thought is that these legs and hips belong to a juvenile or only partially-grown specimen, not a fully-grown specimen, and I see that a few other people have reached the same hypothesis that I have. I too believe that the reconstruction is actually a composite of different-aged specimens. I would strongly recommend a complete re-evaluation of all known and confirmed Spinosaurus and spinosaurid material before making any claims about what this creature might have looked like. According to Dr. Holtz, the pelvis and legs ARE from the same individual as the rest of the bones… what is a composite is the arms… they don’t belong to the same individual, in fact the belong to >several< individuals. So what do that leave us with? Although I certainly think it might have been a very elegant animal in the water, the body is too long to have it walk in land like any dinosaur… and the hands are as far as being the hands of a quadrupedal animal as they can be! And yes… I secretly would like that this reconstruction is wrong… but I have never seen complains at how monstrous a primitive whale looks! Now, the expression aquatic or marine dinosaur is not incorrect at all!!!! This blog has certainly sparked my interest in spinosaurs. Have been rereading and reading articles and scientific papers on the spinosauridae this past week. Another question(s) has arisen about this new Spinosaurus find and spinosaur paleoecology. To begin with the new find shows Spinosaurus has longer neck than other spinosaurs. Is this from articulated material or from composite specimens? It reminds me how past Tyrannosaurus rex skeletal reconstructions had too many tail vertebrae until the 1990 Wankel rex was discovered(Horner and Lessem 1993). 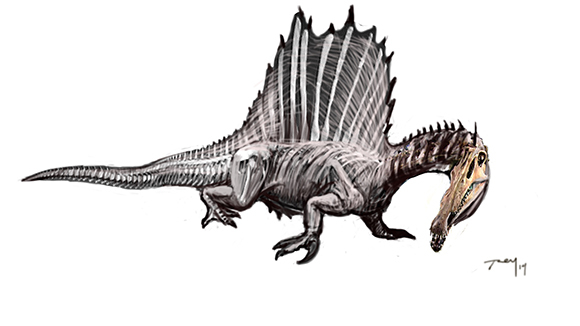 Secondly, I think everyone agrees Spinosaurs were aquatic to semi-aquatic. The isotope studies have confirmed that( Amiot,Buffetaut, Lecuyer 2010). Past and recent findings suggest that maybe the paleoecology of Spinosaurus is similar to the Indo-Pacific(Saltwater) crocodile and American crocodile. Both species are found in freshwater rivers and range into mangrove swamps, and are the only two species of crocodilian that venture out into the ocean(Ross and Garnet 1989). It appears the new finds also show Spinosaurus was distributed throughout North Africa from Egypt to Morocco. In Egypt the paleoecology was mangrove swamps(Smith, Lamanna etl. 2001),(Nothduret and Smith 2002). In Morocco it sounds like the new research team thinks the sediments indicate a river environment. If Spinosaurus has a lifestyle similar to a crocodile, it may well have competed with the giant crocodiles for food, this would have been a very interesting scenario in the cretaceous of North Africa. Not only do you have crocodiles, but the Bahayria oasis also has remains of mosasaurs and plesiosaurs(Smith, Lamanna, etl. 2001). Finally, Ibrahim and Sereno have added more to the growing puzzle of this truly unique theropod. I agree with Scott Hartman’s blog, they have made a great scientific contribution. I still do question certain parts of its morphology that I mentioned in my first post. In conclusion, there needs to be more specimens of this fantastic dinosaur found. Our picture of Tyrannosaurus rex is more complete than Spinosaurus. New specimens will help in our changing picture of Spinosaurs. To bad they went extinct at the end of the Cenomanian Stage. One could imagine how they could have kept evolving further into whale-like creatures if the spinosaurids hadn’t been cut short by the extinction event at the end of that stage.